I’d never intended to call my novel Snegurochka. Titles are tricky, so writer friends made helpful suggestions. Call it ‘Something in Kiev,’ suggested one. The novel is set in Kiev, where I lived for a while in the early 1990s. The place gripped me from the start and I knew that one day I would write about a woman and her orchard, the clash of old Soviet ways and an emerging market economy, the racketeers, the extraordinary character and beauty of the city itself and also motherhood, in which I was immersed. Then, as my first year in Ukraine drew to a close, a young girl with long blonde plaits and a sparkling blue coat began to appear in shops, on cards and at celebrations. 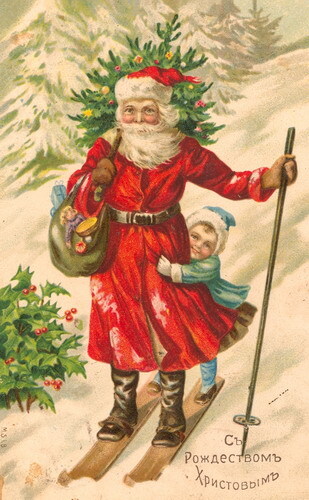 Her name was Snegurochka, the little snow maiden, and she was the granddaughter of Ded Moroz, or Grandfather Frost. With Father Christmas so ideologically unpalatable she’d been promoted across the Soviet Union under Stalin. Her task was to help her grandfather distribute gifts at New Year instead. Snegurochka looked like a fairy princess, pure and kind, and I might have passed her over if I hadn’t discovered that she’d been plucked from an older Russian tale about a child made of snow. Traditional stories have often been appropriated to suit the times. I was interested in that. In my novel, Rachel and Lucas are both storytellers. The latter is a journalist, eager to find the scoop that will make his name. Rachel’s narratives are about herself, constructed from memories, crystalline and fixed. The whole of Kiev in the early 90s seemed full of stories – news, of course, but also lies, and a couple of alluring myths. Rachel, disturbed by what she finds, whispers the tale of the little snow maiden to her baby. She uses the archetypal old couple and the ‘once upon a time’ mechanism to try to anchor herself in a place where she is adrift. Nevertheless, I was wary of symbols. Snegurochka is a Russian export and I was writing about Ukraine. I knew that some nationalists had objected to her dominance. I’d seen a photograph of effigies of Ded Moroz and the snow maiden hanging from a bridge with nooses around their necks. Poor Snegurochka, I thought. She’s an unwitting interloper, a pawn. But when friends assured me she was as popular as ever among most Ukrainians who still dressed their daughters in her ice-blue costume and cheered her in winter parades, I began to investigate further. I discovered that her story could be traced back to Alexander Afanasyev’s 1869 tale in which the snow child created from an old couple’s longing leaps over a fire and melts. In the libretto for Rimsky-Korsakov’s opera The Snow Maiden (1881), Snegurochka is the pagan daughter of Winter, incapable of love until she is granted her wish and expires in the heat of her own ecstasy. At the turn of the millennium, in Moscow, I found her coyly sexualised, used to sell cars and drinks. Then there is Arthur Ransome’s 1916 retelling in which the old couple lose their snow child when they don’t love her enough. Snegurochka isn’t a victim in this version. She chooses to leave. The more I learned, the more I wondered about what she had become. Was she an innocent child, a kind helper and bringer of gifts, a nubile symbol of capitalism, a cultural invader, or a free spirit who comes and goes? She wasn’t my story and I pushed her away but she came back and whispered while I wrote. Traditional tales rarely take centre stage in contemporary fiction; they deal in archetypes, all surface, without depth. Yet they endure, surely, because we are able to project our own preoccupations across their flatness. These preoccupations reflect back at us, influenced by the times in which we live. Snegurochka, the snow maiden, became a kind of touchstone for my novel, even though she is mentioned a mere two or three times in the book. She serves capitalism, communism, Russian, Ukrainian. Her heart is ice cold yet she brings gifts and talks to the birds. When I peered I found a mass of contradictions, and when I blinked she became the title that had been there all along. 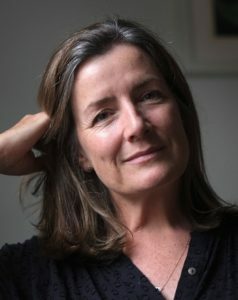 Judith Heneghan grew up in Hampshire and read History at the University of York before living and working in a community for people with learning differences near Dover. Later, after several years as a commissioning editor, she spent time in Kiev, Moscow and Islamabad before settling in Winchester with her four children. She has a doctorate in Creative Arts and has written extensively for young people. She now lectures in creative writing and leads the associated MA programmes at the University of Winchester. 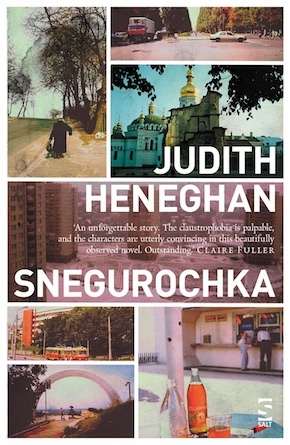 Snegurochka, her first novel for adults, is out now in paperback from Salt Publishing.